In contrast to the several very dubious high-profile choices of the Pulitzer committee for this year's awards, Nicholas Kristof's prize in recognition of his coverage for the New York Times of the Sudanese government's genocidal campaign against the people of Darfur seems uncontroversial and well deserved. But Kristof, and the Times' editors, have consistently failed to cover a key element of the story. Other Arab nations not only defend Sudan's government but actively lobby for it in world bodies and have successfully enlisted fellow Muslim states and additional allies to do the same. The travesty of Sudan being elected to the United Nations' human rights commission is just one demonstration of that support. Blocking of greater UN efforts to aid the people of Darfur is another. The impact of this support goes beyond international bodies. Many nations are reluctant to confront the Arab world in its backing of Sudan, and this has been a major factor in European foot-dragging on the Darfur issue. Even American policy is sensitive to Arab opinion and potential problems with being seen as attacking another Arab regime as the nation continues to pursue the difficult struggle in Iraq. But this crucial factor in the world's response to the Darfur crisis has, with the one recent exception noted, been absent from Kristof's reporting. The extent and impact of Arab support for Sudan's crimes in Darfur are also absent from the rest of the Times. When the Arab League held its annual summit in Khartoum in late March, the Times published two stories on the proceedings. Neither made any mention of Darfur and no editorial addressed the significance, or questioned the propriety, of Arab foreign ministers choosing Sudan's capital as their venue. A Times editorial on Darfur published on April 13 ("Fiddling While Darfur Burns") takes the United Nations to task for "dawdling" and complains of UN Security Council members "China, Qatar, Ghana and Tanzania, that continue to give diplomatic cover to Sudan," but says nothing of the cover given by the Arab League and its membership. This silence on the Arab world's support for Sudan's genocidal regime is part of a broader picture. While the Times did provide some coverage of Saddam Hussein's murder of up to 200,000 Kurds in the late 1980's, it again ignored the theme of broad Arab support for Saddam's program of Arabizing northern Iraq. The Times largely failed to cover Sudan's on and off again genocidal campaign against Christian and animist blacks in the south of the country that claimed about two million lives, and of course ignored as well Arab support for Sudan's policies in the south. The Times prides itself in being a "liberal" newspaper, but it has also consistently ignored liberal voices in the Arab world that have sought to address that world's genocidal attitudes toward religious and ethnic minorities in its midst. Tunisian human rights activist Muhammed Bechri, writing in December, 2004, noted that, "A deafening silence [has been] observed throughout the Arab world on the horrendous crime being committed by [its] fellow Arabs in Sudan." Bechri goes on: "the Arab silence [can] only be explained once we understand the true nature of the twin fascisms of Islamism and pan-Arabism that continue to wreak havoc on Arab land," the former inculcating murderous attitudes and promoting genocidal policies toward non-Muslims, the latter doing the same with regard to Muslim but non-Arab populations in the Arab world - such as the Kurds and the blacks of Darfur. Bechri also observes that popular support in the Arab world for its twin fascisms is bolstered by "the fact that the voices of the Arab human rights community remain of little influence due to lack of access to the official media." He could have added that those voices and their perspectives also lack access to key Western media, including the New York Times. In addition to ignoring the significance of broad Arab opinion on acts of genocide within the Arab world, the Times has also largely failed to cover related stories, such as the pressures on Christian communities in virtually all Arab states and the flight of Christians from those nations, and the forced Arabization campaign that has been waged for decades against the large Berber community - Muslim, but not Arab - of Algeria. Another related story untold by the Times is the murderous, indeed genocidal, hatred of Jews promoted for decades by Arab regimes, both religious and secular, in media, mosques and schools. Bernard Lewis, the West's premier scholar of Middle East studies, wrote in 1986, regarding Jew-hatred in the Arab world, "The volume of anti-Semitic books and articles published, the size and number of editions and impressions, the eminence and authority of those who write, publish, and sponsor them, their place in school and college curricula, their role in the mass media, would all seem to suggest that classical anti-Semitism is an essential part of Arab intellectual life at the present time –– almost as much as happened in Nazi Germany." But again, despite the Times' extensive coverage, in news reports and editorials, of Israel and the Arab-Israeli conflict, the newspaper is virtually silent on this aspect of the story. No doubt this reflects Times biases on the subject. The Times prefers to depict the conflict as mainly a dispute over territory, with Israeli territorial concessions the key to resolution. Acknowledging the genocidal attitudes toward Jews rampant in the Arab world and promoted by Arab governments would cast doubt on this depiction. Indeed, covering the murderous Arab attitudes, and sympathy for genocidal campaigns, toward other ethnic and religious minorities living amidst the Arab world - minorities that do not enjoy sovereignty or even autonomy and are not engaged in border disputes with surrounding Arab populations - would render even less plausible the Times' slanting of the Israeli-Arab conflict, and this very likely figures in the Times' failure to cover those other stories. "Whether Likud or Labor, Jews are Jews... They are terrorists. They are the ones who must be butchered and killed, as Allah the almighty says: Fight them; Allah will torture them at your hands, and will humiliate them... Have no mercy on the Jews, no matter where they are, in any country. Fight them, wherever you are. Wherever you meet them, kill them. Wherever you are, kill those Jews, and those Americans who are like them..."
In an article published eleven days later, Times reporter William Orme notes Israeli claims of the PA's using its official media for incitement, and the slant of his story is clearly to make Israel's complaints look unfounded and ridiculous. He writes at one point: "Israelis cite as one egregious example a televised sermon... 'Whether Likud or Labor, Jews are Jews,' proclaimed Sheik Ahmad Abu Halabaya... " That is all Orme says of the sermon; nothing about Halabaya's exhortations to butcher Jews wherever one finds them, nothing about his assertions that all of Israel belongs to the Arabs, nothing about his invoking of Allah as calling for the torture and murder of Jews. Again, it is very likely that the Times' sins of omission regarding Arab incitement of murder and genocide toward Jews, its distortion of this crucial element of the Arab-Israeli conflict in the service of its own slant on the crux of the conflict and the path to resolution, has figured in its silence on murderous Arab attitudes toward other religious and ethnic minorities in the Middle East and north Africa. To report honestly on those attitudes and their practical consequences would inevitably call into doubt the paper's editorial views regarding Israel and the Palestinians. But, in any case, that silence on Arab attitudes does cast its shadow over coverage of other conflicts in the Arab world, distorting representation of the nature and dynamics of those conflicts. More particularly, it taints the Times' reporting and editorializing on the genocide in Darfur, including Nicholas Kristof's Pulitzer prize-winning coverage. The election of Hamas to governance of the Palestinian territories was met with general dismay in the West and broad declarations of a boycott against the organization until it recognizes Israel’s right to exist and conclusively abandons its terror war against the Jewish state. Yet many in Israel, and Israel’s supporters elsewhere, worried that Western governments would soon begin to ignore Hamas’s genocidal rhetoric, its support for ongoing terror and dedication to Israel’s annihilation, and would seek to establish relations with the Hamas government and provide it international aid. Russia’s prompt reaching out to the Hamas leadership only reinforced such concerns. The anticipated Western compromises with principle have not been long in coming. In recent days, for example, Norway announced that Hamas representatives would be visiting Oslo and meeting with government officials, and France’s President Chirac insisted the international community must pay the salary of the Hamas-led Palestinian regime’s employees. Those interested in Israel’s welfare should be no less worried about inevitable concessions to Hamas from another direction –– voices in Israel that will seek to rationalize Hamas, downplay its genocidal agenda and its threat, and promote Israeli contacts with the new Palestinian government. Indeed, some Israelis were doing so preemptively in anticipation of Hamas’s election victory. In late January, days before the vote, left-wing journalist Uri Avnery rhapsodized about pleasant contacts with Hamas supporters, urged negotiations with Hamas, saw no good reason to avoid such talks, and blamed Israel for blocking the path to peace. Shimon Peres has suggested that the only pre-condition for negotiations should be Hamas’s refraining from violence. If the past is any guide, Israeli voices both calling for talks with Hamas and blaming Israel for the absence of progress toward peace will grow more numerous and shrill. Moreover, they will inevitably advocate for accommodation of Hamas not only in Israel but in Europe and America as well. And they will convince some there to follow their course, while they will be used by others abroad –– individuals, groups and governments –– to justify those others’ own inclinations to appease Hamas. For, as is almost inevitable within chronically besieged communities, the very fear the attackers instill and their constancy in pushing the attack virtually guarantee that some among the besieged, in their desperation for relief, will seek to rationalize the threat, insist the enemy can be reasoned with, and promote accommodation and concessions that they delude themselves into believing will end the threat. This has been a recurrent phenomenon in the history of the Jewish Diaspora, and it has been a constant in Israel in the face of the persistent Arab siege. Israeli apologists for Hamas have existed for as long as the organization has been engaged in anti-Israel terror. Pro-Hamas apologetics were somewhat muted during the Oslo years, but only because those Israelis supportive of Oslo –– including members of Israel’s pro-Oslo governments –– were eager to whitewash Yasir Arafat and his Palestinian Authority. 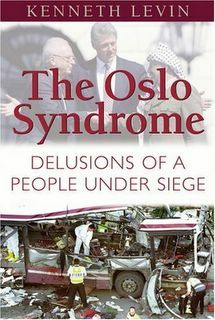 They sought to cast Hamas and Islamic Jihad as the anti-peace camp determined to sabotage Oslo through violence, in contrast to Arafat’s supposed dedication to compromise and peace. Oslo-era governments and their followers pushed this line even though they were fully aware of Arafat’s collusion with Hamas in its terror campaign, his open praise of Hamas and its martyrs, and his encouraging of Palestinian youth –– in PA media, schools and mosques –– to emulate those martyrs’ path. But even during the Oslo period, Hamas had its Israeli defenders. For example, the late Ehud Sprinzak, then a professor of political science at Hebrew University, wrote an op-ed in The Washington Post in October 1997 titled “How Israel Misjudges Hamas and Its Terrorism.” Sprinzak explained that Hamas’s suicide bombings were simply a response to “humiliating Israeli actions,” cited approvingly Hamas statements to this effect, and criticized Israeli leaders for seeking to “demonize” Hamas. Sprinzak was silent about Hamas’s explicitly declared objective of pursuing to the end Israel’s destruction, a reality he preferred to ignore. Hamas will no doubt remain true to its genocidal agenda and continue to promote and pursue Israel’s extermination. With no less certainty, some Israelis will engage in apologetics for those who want to destroy Israel, and their op-eds will appear not only in Israeli media but in the The Washington Post and New York Times as well.